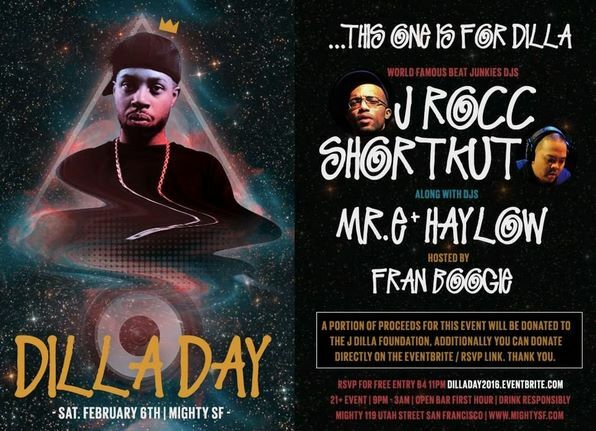 Tonight (February 6th), during the Superbowl Weekend, it’s Dilla Weekend in both San Francisco & Los Angeles to celebrate 10 years of life & music of our fallen brother, J Dilla. 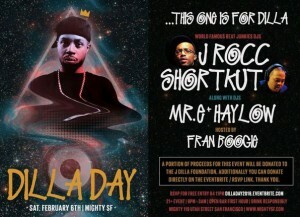 First one, the Funky President J.Rocc & Shortkut will be throwing down at Mighty in San Francisco in honor of Dilla, along with Mr. E, Dj Haylow, & hosted by Fran Boogie. Bay Area, you don’t want to miss this. Also tonight in Los Angeles, Rhettmatic will be doing a special set at the 9th Annual “Doin It For Dilla” at Boombox with residents Inka One, Ben Diggin, & Dj Analog. All happening at The Grand Star Jazz Club. Wherever you are in the world, put one up for the one James Yancey aka J Dilla….one of the greatest music producer of our time!